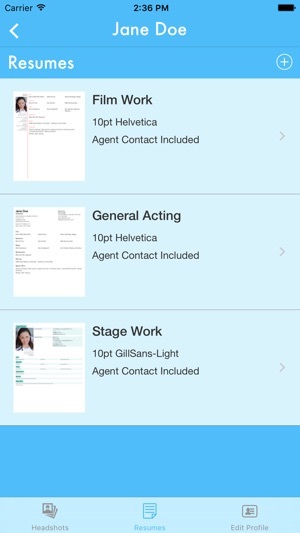 Every actor knows the importance of a great headshot and resume. They are required tools to get you noticed for all the right reasons, but you would be surprised at how many actors don't put their best face forward with a quality headshot and well designed resume. 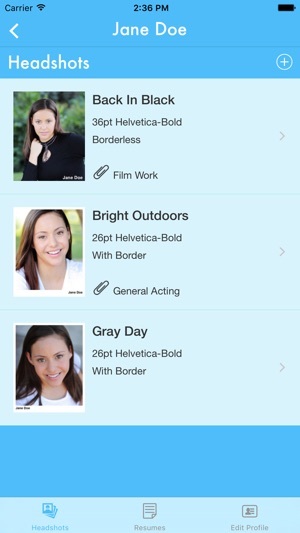 MyHeadshots is a revolutionary new tool to help actors get together their photos and resumes in one location so they can always be within reach when you need them most. -Add photos from your photo gallery, import them from your DropBox account, or even snap one straight from your device's camera for a quick "today" look. -Full-featured photo editor with cropping, enhance tools, blemish remover, among others to make sure your photos look their best. 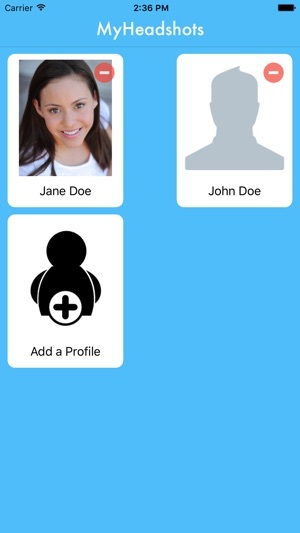 -Control the placement of your name on the headshot, including the font and size, color, and alignment. Choose to have a borderless, a translucent banner, or a more traditional bordered look. -Create a full resume with an editor tailored for acting and a choice of format styles that will make your years of work shine like it should. -Choose the font and size and which information to include on your resume, contact info for you and/or your agent, personal info like height and weight (if desired), it is all up to you. -Import your old resumes, in PDF format, from your DropBox account if you want to keep them handy in case you need them. We hope this tool helps budding and seasoned actors alike and will gladly accept any suggestions for enhancements that will make this tool useful for you in your quest to make it in such a competitive and exciting field. I downloaded this app a few months ago and used it once just fine and not to its full potential, simply to get one last minute headshot. As is industry standard, my daughter was scheduled for a last minute audition. I quickly uploaded a couple recent headshots and this time I actually utilized the Resume portion - I am so amazed. It is so easy! The only thing I don’t care for is that filling out the special skills portion on the Resume is all on one line and is difficult to edit when I want to add something toward the beginning of the line. Anyway, audition is approaching and I’m ready to save these and get them printed to 1 hr photo and the app keeps crashing when I try to save it! Ah! I contact support and receive a response in less than 30 minutes 🙂 that is the best tech support/ customer service around! I would recommend this app to everyone I know in the industry. Just want I have been looking for!! It’s about time someone made this in the smartphone age. More time acting, less time editing. Easy upload and your done. Everything right from your phone. Use with PrintToSize to make it ready to print. Loved the app for years! BUT there needs to be Cloud integration or some form of a backup. I just opened the app (1st time in 2 months) and ALL of my shots were gone!! All of them!!!!!! I hadn’t done anything different with my phone either.